"Jon, the Cynic: Dog Philosophy 101"
Blackwell Publishers 2007, 7 Ediciones. Más de 50.000 copias vendidas. ¿En qué sentido pueden ser considerados cínicos los reportajes de Jon Stewart? ¿Qué es el Cinismo? ¿Cuáles son las diferencias entre el Cinismo antiguo y el moderno? ¿Cuál es la función del Cinismo filosófico dentro de la democracia? - Citado en "Media Savvy: The Thinker. 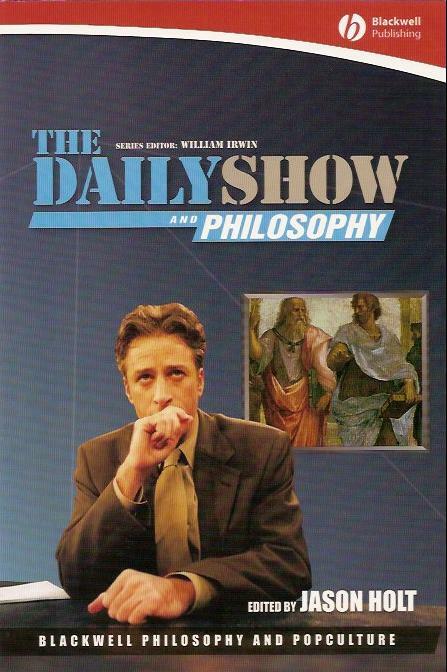 Serious philosophers make the case that Jon Stewart is the Socrates of our day" by Sam McManis. The Sacramento Bee, 10/23/07 Scene section, page E1. - Tema comentado en "The Unexamined joke is not worth telling" 10/24/2007, Chronicle of Higher Education, section "Leadership & Governance". - Tema comentado en "Conversations with Kathleen Dunn" 9/14/2007, 10:00 AM on Wisconsin Public Radio. - Tema comentado en "KPOJ Mornings with Thom Hartmann" 9/14/2007, 6:00 AM on KPOJ Portland. - Tema comentado en "Q" hosted by Jian Ghomeshi 10/29/07, 2:00 PM on Canadian Broadcasting Corporation Radio One. -Reseñado en News@UH, the University of Hawai'i System Newsletter published by External Affairs and University Relations, 03/3/2008. -Reseñado por MaryLynn Saul, Journal of Popular Culture 41.4, August 2008. -"The Wages of Cynicism: Jon Stewart tried for heresy at NAC San Antonio convention"(2007), Jack Lule. "The Political Sins of Jon Stewart"(2007), Roderick P. Hart and E. Johanna Hartelius. "In Defense of Jon Stewart"(2007), Robert Hariman. -"Politics and The Daily Show"(2007), Julia Fox. -"The Daily Show Effect: Candidate Evaluations, Efficacy, and American Youth"(2006), Jody Baumgartner and Jonathan S. Morris, American Politics Research.